The Art Of Policlicks: Politicians Can't Get Enough Of Social Media : It's All Politics With the debt-ceiling hanging Damoclean over Capitol Hill, politicians may not be speaking to each other very much, but they are using the latest technogadgetry to talk with – or, at least, to --their constituents. 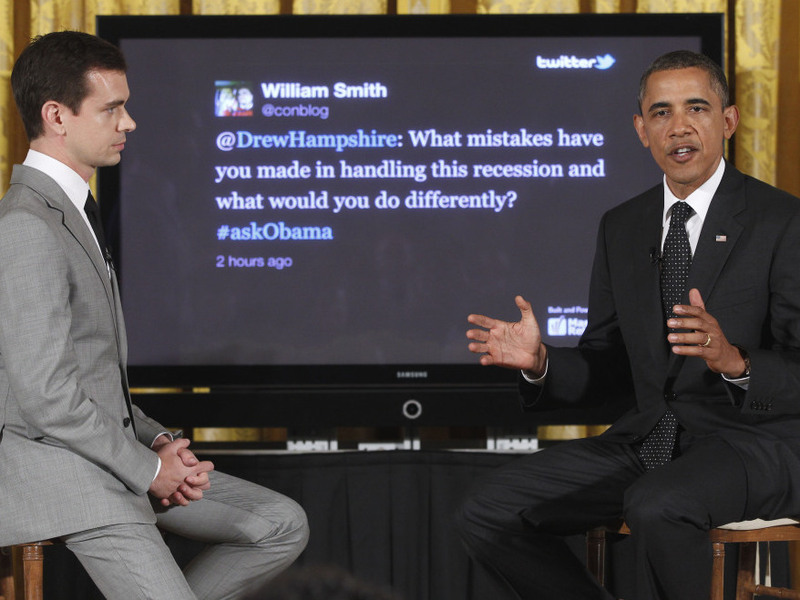 President Obama with Twitter co-founder and Executive Chairman Jack Dorsey at this first Twitter town hall, Wednesday, July 6, 2011. With the debt-ceiling hanging Damoclean over Capitol Hill, politicians may not be speaking to each other very much, but they are using the latest technogadgetry to talk with – or, at least, to --their constituents. "Over the past week, our team has seen a marked increase in the number of members of Congress speaking directly to constituents through their official Facebook pages," Andrew Noyes, manager of Public Policy Communications at Facebook, writes in an email. "Lawmakers from both parties are taking the pulse of their constituents in various ways — from polls that use Facebook Questions to videos asking people to share their opinions on what Congress should cut or tax." Facebook is not the only site seeing political postings – and posturings. According to a recently released report from the nonpartisan Congressional Management Foundation, most members of Congress are using social media "to gauge public opinion, communicate with constituents and reach new people." The foundation's survey of congressional offices shows that 64 percent believe Facebook is "a somewhat or very important tool for understanding constituents' views and opinions." About 42 percent feel that way about Twitter and 34 percent about YouTube. Almost three-quarters (74 percent) ascribe to the notion that Facebook is important for getting out their member's messages. "Members of congress have always put a lot of effort into trying to figure out what their constituents want — their jobs depend on it, after all," says Philip Edward Jones who teaches political science at the University of Delaware. "So using Facebook to gauge constituency opinion is just a new means for achieving an old end." A quick glance at a few sites of key players, however, reveals that politicians often use social media to hammer home their ideas rather than to engage with those back home. In other words, the pols are more active than interactive. * Through its official Twitter account, the White House makes its points over and over again. "What is the status of the FAA?" one Tweeter asks. And the White House replies: "Bc Congress hasn't acted, nearly 4k workers have been furloughed." * Rep. Michele Bachmann (R-MN) posts a form on the official Team Bachmann Facebook page stating "I need to hear from you on the Debt Ceiling." What she really wants to hear people says is they agree with her. "I need your help," she adds on the page, "to show the Washington elite that the American people have good reasons to oppose raising the debt ceiling. "She has also put up a YouTube video on the debt ceiling issue. · Speaker John Boehner (R-OH) uses his Facebook page as a re-state update. A recent wallpost: "As I said tonight, the debate over our job-crushing debt isn't about President Obama and House Republicans. It's about what's standing between the American people and the future we seek for ourselves and our families." As of last count, more than 9,500 Facebookers "like" what Boehner has to say and more than 12,000 have comments – some from Boehner bashers. * And Rep. Nancy Pelosi (D-CA) taps into her Twitter account to lead her followers to a 20 minute CSPAN clip: "Video of my presser on GOP using default as an excuse to unravel Medicare & Soc Sec while ignoring jobs." So does all of this social media hullabaloo change the representative/constituent equation at all? Yes, says Philip Edward Jones. One salient difference "is the ability for members of congress to have it both ways on an issue or fudge their position." In the past, he explains, "Representatives could carefully craft two versions of their position on a bill: one to be sent to constituents who had written urging a 'yes' vote on a bill — signaling that they supported it, and one to be sent to those urging a 'no" vote' — suggesting that they opposed it. Both sides would come away thinking their Representative agreed with them." Now with blatantly public social media, Jones says, "that doesn't work when the yesses and the nos can both see your wall post. So to some extent it might force members to be less equivocal in their position-taking. And the clearer they are about their position on a bill, the more likely constituents are to know what they've done, and to hold them accountable for it."